« How important is the response rate? In developing a direct marketing program, one of our first steps is to determine where our program will fit in the sales process. This is done through the direct mail offer. You may already know that the offer is one of the two critical elements in direct marketing (the other being the list), but from my observations, very few people really understand the offer. 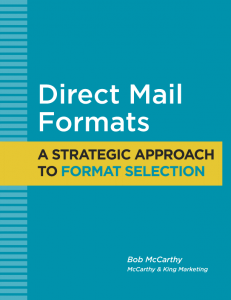 The direct mail offer is not a complicated concept, but for some reason, many people responsible for creating direct response don’t seem to recognize its power or understand how to manipulate the offer to match the direct response objective. 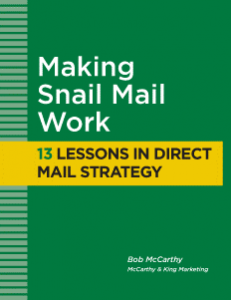 In many (but not all) mail-order businesses, direct marketing combines these steps into a one-step process by going right to the sale. In this case, offers (meaning price, discounts, premiums, delivery, payment terms etc.) are used to close the sale. But the one-step sale is the exception. Most businesses use all or some of these steps to work their way to a sale. For those using this multi-step approach, it usually involves a combination of face-to-face, telephone and direct response (mail, ads, email) contacts. For example, a typical sales process might include an initial inquiry using direct mail, lead qualification by telephone and the proposal and closing by a face-to-face sales call. So before anyone can (or should) develop a direct response program, there must be some understanding and agreement of how the sales process works for their particular company and product. With that understanding, we can then develop specific offers that match the objective. 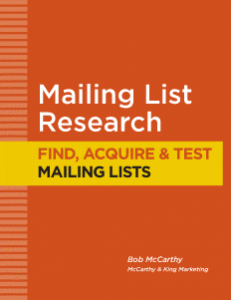 If we are looking for a lot of leads (but not necessarily high quality leads), we might offer a white paper or how-to booklet with useful information on the product category. This will help us identify prospects with a general interest in our product category (but not necessarily in our product). These offers will give us the highest response rate but the quality may be suspect. To improve quality, we usually ask some qualifying questions. If we are looking for better quality leads, we might offer an information kit, catalog or product brochure. This will help us identify prospects with a specific interest in our product, but the commitment is still limited. Again, qualifying questions will help us improve the quality of the response. If we are looking for high interest or highly engaged leads, we might offer a free seminar, demonstration, cost analysis or current product evaluation/critique. (Many reply cards simply say “Please have a representative call me.) These offers – when people respond to them – often (but not always) result in a face-to-face meeting. Because the respondents are willing to meet with you or share information with you, it is safe to assume they are more committed and further along in the sales process. Of course, the response rates are lower. If we are looking for sales-ready leads, we might offer a custom quote (based on prospect’s input) or a free limited-time trial of our product. Most of these respondents should be very close to making a purchase. 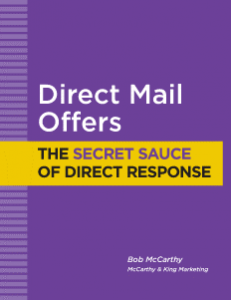 Try to look at the nuances of your direct mail offer. You can maximize response by making the incentive more appealing and by making response easier and with less commitment. You can then tweak minor aspects of your offer to match your objective. Keep in mind that the smallest change in your offer (e.g., asking 4 questions instead of 3; or adding a reply card vs. just an 800 number) does in fact change your offer and will change your response rate. And try to keep your sales people involved. Direct response is designed to serve the sales process but it will only work if your sales people buy into it.